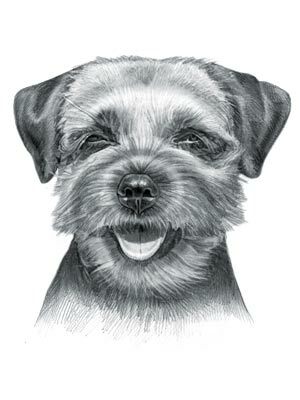 Terrier Breeds: The origin of the word 'terrier' is derived from the Latin word 'terra' meaning "earth" as so many of the terrier breeds were originally bred and trained as hunting dogs to pursue their prey, such as rats, foxes, squirrels and badgers into their bolt holes, lairs and burrows. This was an essential task to help farmers contain the number of predatory, small animals and vermin that raided their produce and foxes that attacked their poultry. Many Terrier breeds are named after the regions in which they were originally bred, such as the Manchester Terriers and the Boston Terriers. Other members of the group, such as the Rat Terriers and the Fox Terriers were named for the types of animals they traditional hunted. The small, robust, Terrier Breeds with short legs hunted their prey below ground whereas the larger, longer legged breeds hunted their quarry above ground. Working Terrier Breeds: 'Terriermen' was the name given to the handlers who worked and handled working terriers engaged in the role of pest control in which the dog chased and sometimes killed the quarry. The rise of the late 18th Century Enclosure Movement in England and the practice of enclosing fields with hedges and fences also saw the rise of the working terriers and the Terriermen. When the Working Terriers, such as the Jack Russell Terriers, Patterdale Terriers, Border and Fell Terriers, were exported to America they were also used for 'pest control' hunting small animals such as the possum, groundhog (also known as woodchucks), gray fox, red fox and even raccoons. Names List of the Terrier Breeds: The names list of the Terrier Breeds are the Airedale Terriers, American Staffordshire, Australian Terriers, Bedlington Terriers, Black Russian Terriers, Border Terriers, Boston Terriers, Bull Terriers, Cairn Terriers, Dandie Dinmont Terriers, Glen of Imaal Terriers, Irish, Kerry Blue, Jack Russell, Lakeland, Manchester (Standard), Miniature Bull, Miniature Schnauzer, Norfolk Terriers, Norwich, Parson Russell, Patterdale, Rat Terriers, Scottish, Sealyham, Silky, Skye, Smooth Fox, Soft Coated Wheaten, Staffordshire Bull, Tibetan, Toy Fox, Welsh, West Highland White, the Wire Fox and the Yorkshire Terriers. Breeds - The Airedale Terrier: The medium size, self-assured Airedale Terrier (AKC:1888) and used as a Watchdog and Hunter. Breeds: American Staffordshire Terrier: The medium sized, faithful, attentive, steadfast American Staffordshire Terrier (AKC:1936) and is used as a Watch dog and Guard Dog. It is also referred to as a Bay Dog due to its distinctive baying. Breeds: Australian Terrier: The small, even tempered, sharp, companionable Australian Terrier (AKC:1960) and used to hunt vermin such as mice and rats. Breeds: Bedlington Terriers: The small, loving, spirited, clever Bedlington Terrier and used to hunt rats, mice and badgers. Breeds: Black Russian Terriers: The large to giant sized, energetic, self-assured, courageous Black Russian Terrier is not a true terrier and belongs to the Working Dog Group (AKC:2004) and used as a Watch dog, Fighter and Military Dog. Breeds: Border Terriers: The small, fearless, loving, responsive Border Terrier (AKC:1930) and used to hunt mice, rats and small game. Breeds: Boston Terriers: The small, lively, playful, loving Boston Terrier (AKC:1893) and used to hunt rats. Breeds: Bull Terriers: The medium sized, protective, courageous, active Bull Terrier (AKC:1885) and used to hunt small and large game and catch poachers - it is also referred to as a Catch Dog. Breeds: Cairn Terriers: The small, fearless, assertive, active Cairn Terrier (AKC:1913) and used to hunt mice and rats. Breeds: Cesky Terriers: The small, calm, placid, cheerful Cesky Terrier, also known as the Czech Terrier, was used to hunt mice and rats. Breeds: Dandie Dinmont Terriers: The small, loving, lively, determined Dandie Dinmont Terrier (AKC:1886) and used to hunt badgers and otters. Breeds: Glen of Imaal Terriers: The medium sized, nimble, faithful, courageous Glen of Imaal Terrier (AKC:2004) and used to hunt badgers, squirrels and foxes. Breeds: Irish Terriers: The medium sized, protective, lively, dominant Irish Terrier (AKC:1885) and used as bird setters and retrievers. Breeds: Jack Russell Terriers: The small, courageous, alert, independent Jack Russell Terrier (AKC:2012) and used to hunt foxes, rats and mice. Breeds: Kerry Blue Terriers: The medium sized, spirited, alert, loyal Kerry Blue Terrier (AKC:1922) and used to hunt rats, mice and otters. Breeds: Lakeland Terriers: The small, independent, bold, friendly Lakeland Terrier (AKC:1934) and used to hunt mice, rats, otters, squirrels and foxes. Terrier Breeds: Manchester Terriers: The small, loyal, active, alert Manchester Terrier (AKC:1887) and used to hunt mice and rats. Terrier Breeds: Miniature Bull Terriers: The small, energetic, courageous, loving Miniature Bull Terrier (AKC:1991) and used as a Fighting and Hunting Dog to hunt rats and mice. Terrier Breeds: Miniature Schnauzer: The small, friendly, alert, obedient Miniature Schnauzer (AKC:1926) and used to hunt mice and rats. Terrier Breeds: Norfolk Terriers: The small, companionable, spirited, fearless Norfolk Terrier (AKC:1979) and used to hunt foxes, squirrels, rats and mice. Terrier Breeds: Norwich Terriers: The small, sensitive, affectionate, energetic Norwich Terrier (AKC:1936) and used to hunt mice, rats and foxes. Terrier Breeds: Parson Russell Terriers: The medium sized, bold, energetic, responsive Parson Russell Terrier (AKC:1997) and used to hunt fox, squirrels, rats and mice. Terrier Breeds: Patterdale Terriers: The small, inquisitive, bold, loving Patterdale Terrier (Rare Breed) and used to hunt rabbits, fox, squirrels, rats and mice. Terrier Breeds: Rat Terriers: The small, inquisitive, loving, lively Rat Terrier (AKC:2013) and used as a Watch dog, Ratter and Farm Dog to hunt mice and rats. Terrier Breeds: Scottish Terriers: The small sized, sharp, feisty, independent Scottish Terrier (AKC:1885) and used to hunt mice and rats. Terrier Breeds: Sealyham Terriers: The small, calm, fearless, loving Sealyham Terrier (AKC:1911) and used to hunt foxes, badgers and otters. Terrier Breeds: Silky Terriers: The small, inquisitive, sharp, loving Silky Terrier belongs to the Toy Dog Group (AKC:1959) (because of its size) and used as a Ratter. Terrier Breeds: Skye Terriers: The medium sized, fearless, faithful, loving Skye Terrier (AKC:1887) and used to hunt otters and foxes. Terrier Breeds: Smooth Fox Terriers: The small, sharp, loving, active Smooth Fox Terrier (AKC:1885) and used to hunt mice, squirrels, rats and foxes. Terrier Breeds: Soft Coated Wheaten Terriers: The medium sized, energetic, spirited, loving Soft Coated Wheaten Terrier (AKC:1973) and used to hunt mice and rats. Terrier Breeds: Staffordshire Bull Terriers: The medium sized, reliable, courageous, loving Staffordshire Bull Terrier (AKC:1974) and used to hunt rats and mice. Terrier Breeds: Tibetan Terriers: The medium sized, loving, energetic, sweet-tempered Tibetan Terrier belongs to the Non Sporting Dog Group (AKC:1973) and used as a Herding and companion dog. Despite its name this breed is not a true terrier. Terrier Breeds: Toy Fox Terriers: The small, spirited, faithful, sharp Toy Fox Terrier belongs to the Toy Dog Group (AKC:2003) and used as a Ratter and Lapdog. Terrier Breeds: Welsh Terriers: The small, loving, spirited, independent Welsh Terrier (AKC:1888) and used to hunt badgers and otters. Terrier Breeds: West Highland White Terriers: The small, loving, lively, sweet-tempered West Highland White Terrier (AKC:1908) and used to hunt mice, rats, squirrels, fox and badgers. Terrier Breeds: Wire Fox Terriers: The medium sized, sharp, bold, fearless Wire Fox Terrier (AKC:1885) and used as a Watch dog and Hunting Dog. Terrier Breeds: Yorkshire Terriers (Yorkie): The medium sized, sharp, bold, fearless Yorkshire Terrier (AKC:1885) and used as a Hunting Dogs using their fast speed to chase foxes.